Umwelt is a brilliant time - lapse video which shows flowers blooming while small insects are crawling on top of them. This is a brilliant photography and editing done by Japanese artist, Yoshiyuki Katayama. The unique feature about this time-lapse video are the crawling insects, which seem to stay with the flowers, till they have bloomed and then they take off. The crawling insects move at their own pace, creating an illusion that the flowers are blooming at the same rate. Katayama has also created a website which shares tidbits about the pairing of the insects and the flowers. "Umwelt" recently won third prize during the 2nd Vertical film festival which was held in Australia. 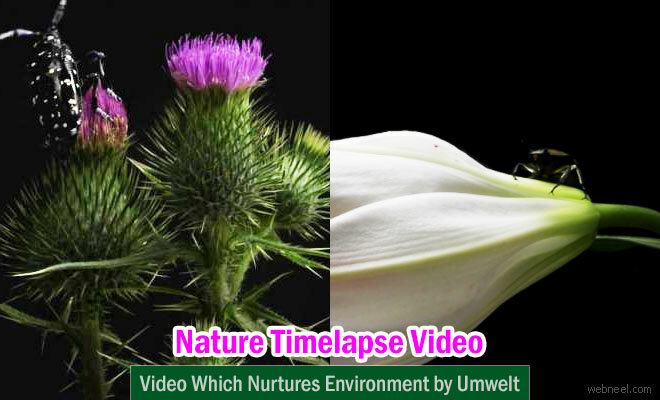 Umwelt is a beautiful time-lapse video which is a result of clever editing with different time-lapse video merging. The pictures were shot using Canon EOS 7D. The artist shot the films in both horizontal and vertical illusion and both the videos are amazing. Vimeo has also selected "Umwelt" as the staff pick, which brings in more recognition for the artist.